March Coupon: Get 10% Off on Bike Accessories! Save 10% Off on Bike Accessories throughout March at LighTake.com! With coupon code: BIKEMARCH at checkout. Sale Ends 3/31. Shop Now. Easter Coupon: Get 10% Off on Home Decor!! 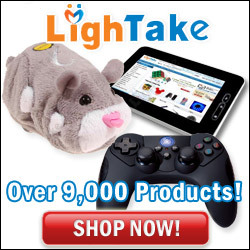 Save 10% Off on Home Decor for Easter at LighTake.com! With coupon code: EASTERHOME at checkout. Sale ends 3/27. Shop Now. Save 10% Off on Jewelry throughout February at LighTake.com! Use code: SWEETJEWELS at checkout. Shop Now. Daylight Savings Time Coupon: Get 10% Off Watches. Be ready for Daylight Savings Time with 10% Off Watches from LighTake.com! Use coupon code: WATCHES10 at checkout. Shop Now. 2 in 1 Hair Curling and Straight Irons Rod Set. Brand new 2 in 1 Hair Curling and Straight Irons Rod Set. Helping you make beautiful curling/ straight hair without hurting your hair quality. Power indicator light, and five LED display temperature levels:120, 140, 160, 180, 200 (?). Allows you to control the temperature and adjust the proper temperature to beautify your hair style. Sleek, ergonomic, non-slip grip ensures you superior comfort while using. Super straight styles, never stick to the hair. Cable comes with the EU plug. Suitable for dry and wet hair. So buy this 2 in 1 Curling and Straight Iron Rod Set Only $5.11 at LighTake.com. The product applies to cell phone that support "OTG" function (not only Samsung, but also Nokia, Sony, for example: Samsung Galaxy series, N8 of Nokia series). Support Micro SD card, the maximum memory is 32GB. One port is micro USB male, the other end is USB 2.0 male. The data in USB disk can transfer from cell phone to PC or PC to cell phone, such as photos, videos, the office document. Get Special Price For CR-128 2-in-1 USB / Micro USB OTG & Micro SD Memory Card Reader for Samsung Nokia Sony Phone - White + Silver (Max. 32GB) Now $2.17. Special Price: Women�s New Fashion Trend Batwing Sleeve Irregular Knitwear Cardigan Shawl!! Women�s New Fashion Trend Batwing Sleeve Irregular Knitwear Cardigan Shawl. 100% brand new and high quality. Batwing short sleeve,irregular style. Newest street fashion, casual and Korean Boho. Soft and comfortable to wear, easy to match with your outfits. Fit for most occasions like school,work, business, party, hanging out. Buy at Special Price: Women�s New Fashion Trend Batwing Sleeve Irregular Knitwear Cardigan Shawl Now $5.04. Special Price: Plush Pat Circle Hand Ring Snowman Slap Bracelet Gifts!! Plush Pat Circle Hand Ring Snowman Slap Bracelet Gifts. This product game is very simple, direct straight into a straight the circle, then applauded with circle, gently pat on the back on your wrist, making circle will immediately according to the size of your wrist curls on your wrist. This product is suitable as a gift to give others, also suits ourselves. This product can be worn on any party. Buy this at Special Price: Plush Pat Circle Hand Ring Snowman Slap Bracelet Gifts! !